That is the number of people that use a mobile phone as of 2018. 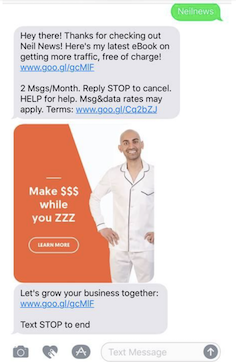 What does that mean for SMS marketing? More pretty eyes on your SMS campaign. People check mobile phones 85 times per day on average, which means you will have an impressive 82.1% SMS open rate. 75% of people wouldn’t mind receiving an SMS text message from a brand. SMS marketing is becoming more popular than ever before because of the importance of phones to people. This will not rescind as Statista projected a whopping 4.68 billion people will have mobile phones in 2019 and 4.78 billion in 2020. SMS marketing is under-utilized and under-appreciated by most businesses because of its simplicity. SMS seems like an old term but that does not mean it is not relevant provided you have a great SMS marketing strategy in place. A thoroughly designed SMS marketing strategy will help to channel your energy and resources in the right path. That’s exactly what you will learn in this article. As soon as a user subscribes, you have the permission to send them messages. The first message you can send to them is a short welcome message. The truth is, most customers or subscribers expect a welcome message. This is the reason it has a high open rate. In fact, most customers will expect it from you. A welcome message helps you create a first impression and set the right foot for your relationship. It helps users remember their subscription. This will also help your subscriber to be open to receive more SMS messages from your business in the future. A good example of a welcome message is from Fashion Era’s company. A customer named John received a welcome message after sending ‘YES” to a text opt-in. Check it out below. As you can see from the image above, the message is short, personalized and a bit of promotion was added to encourage John to shop with Fashion Era. To create an effective welcome message follow the tips above. Personalized it by addressing the subscriber by their name. Add a call to action. i.e. Tell them what to do next. One of the best ways to engage your leads after sending the welcome message is to send new offers or content to them. Exclusive deals and discount deals work best for this SMS marketing strategy. It is a great way to reward your customers who have been doing business with you for some time and have given you permission to send them messages by signing up. It will also increase your subscribers’ excitement, makes them feel special, and get them to buy regularly from you. Sending regular content or offers keeps engaged with your business. 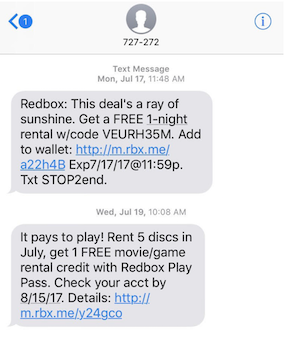 A good example of this SMS marketing strategy is from Redbox. Don’t send the same offer all the time. Change it up and send different products or service. Don’t send offers from a different business to your subscribers. It is a breach of trust. Make sure you send your offers at the right time. E.g. Don’t send Christmas offer during the Easter period. Segment your customers based on their purchasing habits, location, and demographics. 3.Send reminders for webinars, scheduled appointments, demo, etc. Most people are busy with running their day-to-day activities they forget important things like scheduled appointments, events, demo and webinars. Every one of us has missed one or more appointment at some point in our lives even if you are the most organized person. Sending an SMS message to remind your subscribers about an upcoming event in order. It will help them remember their commitments and it also helps your business to run efficiently. For example, a property management company – Marketplace Homes sent text reminders to their clients, and they went from an average of 25% of voice mail confirms returned to about 85% of their text messages confirms returned. This helps them to plan their days and accommodate drop-ins. 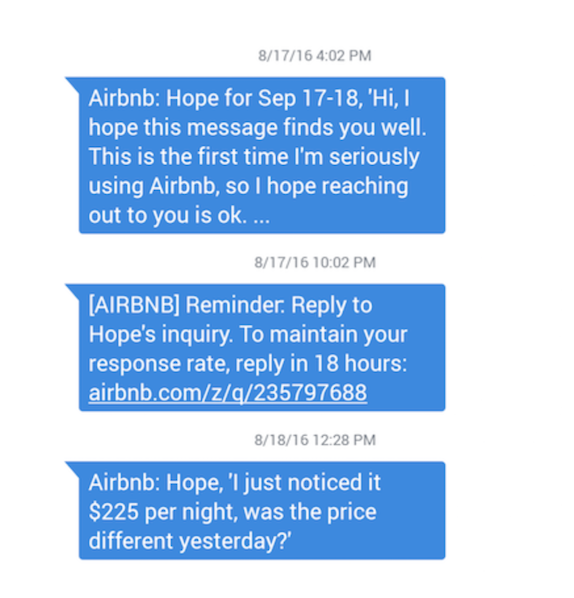 Also, Airbnb uses SMS messages to send reminders to their hosts to reply to clients’ inquiries and in the process, they explain why they need to reply quickly to clients inquiries. Sending reminders is an efficient SMS marketing strategy with abandoned shopping carts. A lot of customers abandoned their shopping carts. 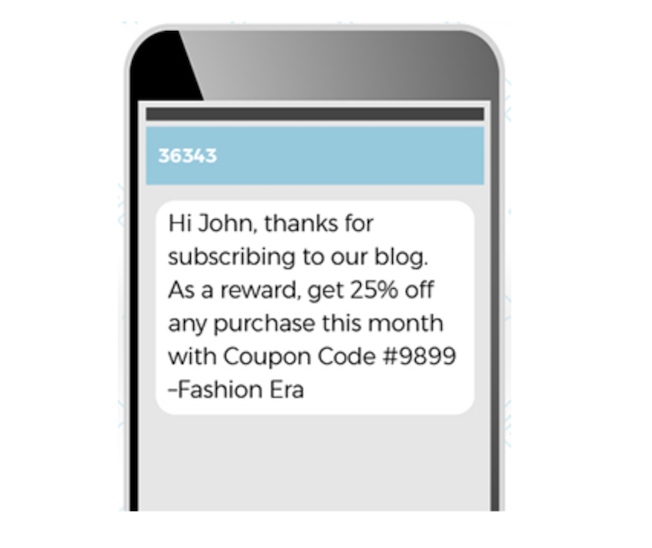 Sending a reminder through text is a simple way to remind them to come back to complete their purchase. According to a study, customers who return to their cart to finish a purchase spend 55% more than people who start and complete the shopping process. If it is possible, add urgency to your reminders just like Airbnb did or give them reasons they need to keep the appointment. SMS marketing is not only for sending promotional emails, welcome messages and reminders, you can also use it to send downloadable content to your subscribers through a link. It is an incredible way to engage your audience. The downloadable content can be a free e-book, report, app or even a ticket. SMS message click-through rates are high. It hovers around 35%. That is over ten times the click-through rate of marketing emails. Check out an example below from Neil Patel. Customer happens to be the backbone of businesses. However, for customer support to be effective, it has to be instant support and it should be on a convenient channel where it is easy to read and respond. What other channel is better than the mobile where 95% of SMS messages are read within 3 minutes of being sent and the average response rate is 90 second. According to a research study, 79% of companies believe customers want SMS support and it will amaze you to know 38% of contact centers offer SMS. 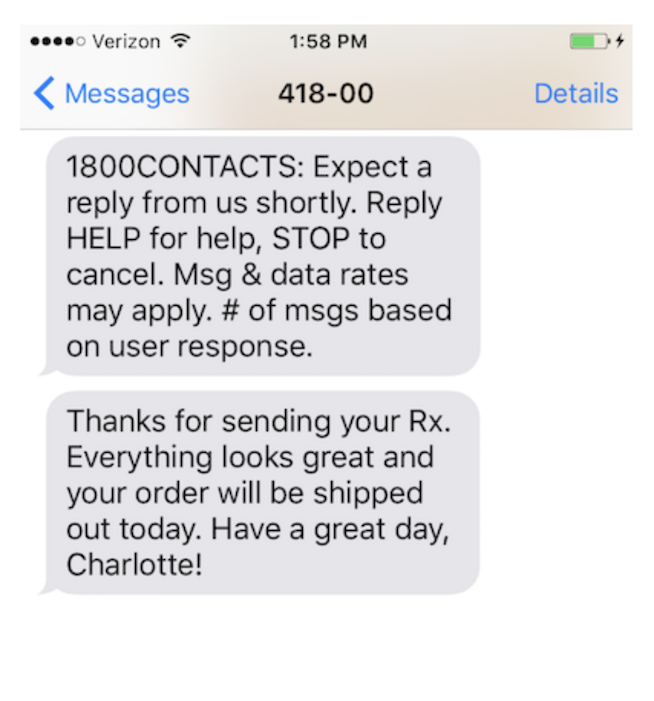 This makes SMS messaging to work better for customer support than any other channel. Customers can quickly read and respond to messages even as they are carrying out their daily activities. It keeps your customers happy and satisfied. SMS marketing for customer support is wide-reaching, convenient and helps customers to have a written record of communication with your company. A good example of using SMS for customer support is what 1-800 contacts did below. 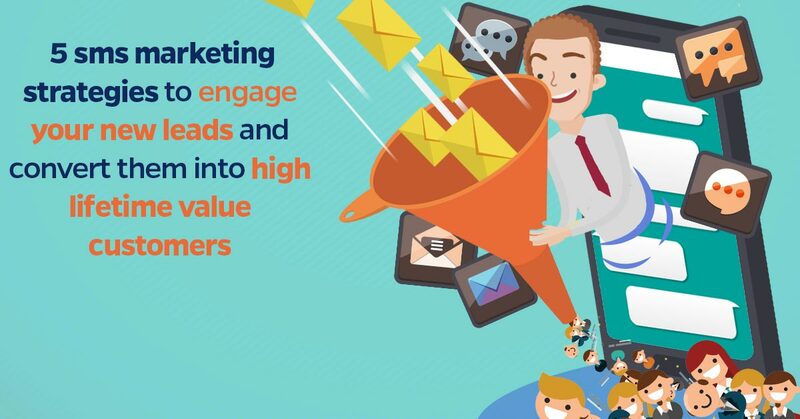 Above are 5 SMS marketing strategies you can use to engage your new leads and convert them into high lifetime value customers. Have you tried any of the SMS marketing strategies above? What was the result? Share with us in the comment section below.